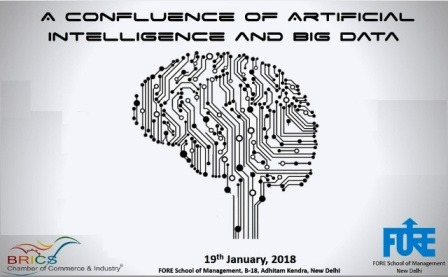 Speakers from Hero Motocorp, IBM, Amazon India, Oracle, HCL and Accenture Labs would grace the upcoming conclave on Artificial Intelligence organized by FORE School of Management, New Delhi in collaboration with BRICS Chamber of Commerce and Industry. The agenda of the conclave is to provide insights into the present and future impact of AI on enterprises. It will also feature tools and methods to prepare, organize and tap into AI’s transformative power; and to unearth practical applications and current commercialization of AI technologies across industries. According to Prof. Shilpi Jain, faculty at FORE and convener of the conference, “If tech experts are to be believed Artificial Intelligence is leading to numerous disruptions in the way businesses operate and are supposed to have the potential to transform the world impacting our daily lives to a great extent. Many of us are already used to with the Amazon’s ALEXA or Apple’s SIRI or the even the Android’s Assistant. The objective of the confluence is to hear from the subject matter experts on how AI may be responsible for exponential growth in human cognitive abilities and deliberate on the possibilities of how smart machines with human like intelligence, could transform the way we work by replacing human beings with AI inbuilt machines and software and how organizations or societies need to be equipped to deal with this transformation”. The conclave is open to Faculty, Research Scholars, Industry Delegates and Corporates. · Demystifying Artificial Intelligence – How AI is Changing Business? · Big Data Analytics – What does the future hold? For further details reach conference convener at aiconclave@fsm.ac.in. To attend the event one can register online.